Home » Russian literature » Vozmezdie [Retribution]. Original wrappers printed and decorated in blue and black. Very attractive decorations both to covers and inside. Edges a little chipped, small tears to spine where sewn, paper inside browned but generally a good copy. Owner name lightly in pencil to upper cover. ; Blok's long narrative poem started in 1910 and first published in its entirety in the year following his death. 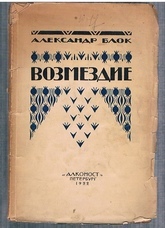 Publisher's mark by Annenkov. 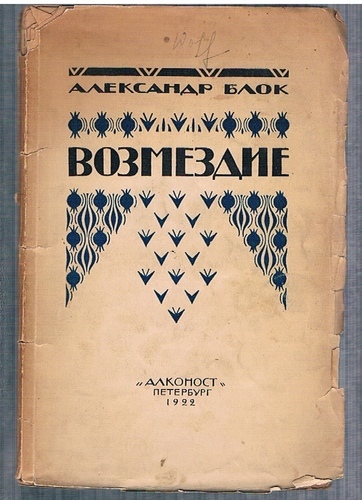 Cover design and decorations inside by the Ukrainian artist and illustrator V A Zamirailo.